It isn’t breaking news that you need to save money. That is one of the first financial lessons that everyone learns, yet it can be one of the hardest ones to follow. Extra money can be hard to come by for many, and it seems like every dollar that you make has already been spent in one way or another. Saving money, even when it is a goal that you are focused on, can be easier said than done at times. However, it isn’t impossible. By using some simple techniques, and being disciplined about your habits, you can find some simple ways to save money and improve your financial situation. Most often, it is the simple tricks that are the most effective when trying to save money. You probably don’t have to make drastic changes to your lifestyle in order to start saving money. Rather, just pay attention to the details in your day to day life and make smart decisions. To help you get started, consider using these three simple ways to save money and watch your bank account start to grow as a result. Dining out on a regular basis is one of the fastest ways to spend your money without really noticing it. Eating out is significantly more expensive than cooking dinner at home, and it is usually not as healthy, either. By making a habit of doing some weekly grocery shopping and preparing almost all of your meals at home, you can save quite a bit of money along the way. This is especially the case if you use coupons to save money as well as stick to a meal plan. Not a great cook? The internet is an excellent resource of cooking tips and recipes, most of which can be found for free. After just a little practice, you might find that you enjoy your own food more than restaurant meals – and they will be cheaper as well. This doesn’t just have to be left to dinners only though, a 2013 study shows that Americans who eat out for lunch at least twice a week spend $1,000 per year. Bills that come each month can start to be a drain on your bank account if you aren’t using the goods or service that those monthly expenses pay for. Common monthly bills that can be eliminated include gym memberships, newspaper subscriptions, expanded cable packages, rented storage space, and more. That doesn’t necessarily mean that you should cut down all of these costs if you are actually getting your money’s worth. For example, if you use your gym on a regular basis, that is probably an expense that is worth keeping. However, if you only have a few items in your storage unit, you may be able to cut back on that and find a place around the house to store them – or even better sell them off! I’d much rather sell something I’m not using and make a little money while at it as opposed to spending more to keep crap I don’t need. Spending money on interest is particularly painful because you get absolutely nothing in return for it. Some interest, like that on a mortgage or even a car loan, is somewhat unavoidable for many of us. However, credit card interest can often be avoided entirely, and you will do yourself a big favor if you do so. Make an effort to pay off your high-interest credit cards first so you can stop paying interest on them ASAP. Not only will this help you in terms of paying off debt quickly, but it will also give you more money to save for yourself in the future. When it comes down to it, when you’re in debt you’re only enslaving yourself to someone else. In the case of credit card debt, you’re simply financing things you want at rates that are astronomical. When it’s the case of a house, it can be argued that you’re getting something of value out of it. Beyond that, debt will generally serve you no good – especially if you’re looking to actually save money in the long run. 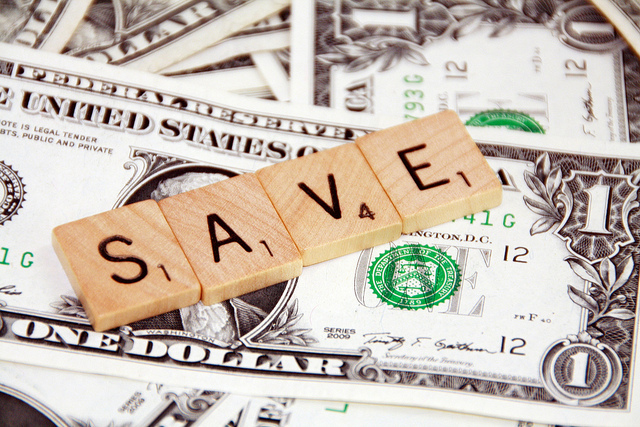 What are some other simple ways to save money? What is the strangest things you’ve done to save money? Great 3 simple tips! The worst of the 3 is paying interests, specially credit cards when you don’t pay on time. Thanks Ariel! I agree, that can be the worst. Eating dinner at home is a huge one! Eating out is so expensive for us. I could not agree more Holly! The last time we went out to eat it just boggled our mind that we could’ve bought a weeks worth of groceries for that one meal. It just wasn’t worth it. Hey John, great tips. Another tip that I’d give is to buy fresh foods. It’s healthier, tastes better, and it’s cheaper than the processed goods! Great tip Josh! That’s the crazy thing, many thing processed food is cheaper. I’m sure there are some that might be, but when you start looking at the long term cost then fresh is hands down cheaper in my opinion. When I grocery shop, I tend to buy things on sale and meal plan around those things. Then my wife and I will spend some time on Sunday cooking 2 meals for the week. By having food pre-made, we reduce the odds of “being lazy” and just ordering a pizza. That’s a great way to do it Jon! That’s similar to what my wife and I did before we had kids. It made it so much easier to avoid just mindlessly spending money on eating out. Hey, John…didn’t know you had another site…looks good! Cooking at home is a big money saver. When I compare the cost of cooking dinner versus going out…it’s hard to stomach eating out when I see the prices. But of it’s still nice to go out once in awhile to treat yourself and not have to cook/clean. And those monthly expenses…sometimes you don’t even notice them because it’s just automatically deducted from your account or charged to your credit card. But there are plenty of pesky expenses that can be cut out to save money. Yep, I just bought it about six weeks ago. 🙂 I know, I feel the same way. It’s nice to go out every once in a blue moon, but when I see that we could buy a certain amount of groceries for that one meal that’s a pretty good encouragement just to stay home. Hi John and I like the site! I agree with all three points but in our case I think the DH and I keep the most money in our pocket by not eating out often. We tend to eat at home the vast majority of the time. We do go to a restaurant usually once a month and we still try our best to minimize the bill lol. Thanks Kassandra! Eating out can definitely waste some money, but you need balance which it sounds like you definitely have. Saving money with Dinner at home is such a large part for our equation of cutting costs, there is so many great restaurants in the Chicago area, but I have to remember they cost my Financial Independence and I’m also not that bad of a cook! That it is. I can imagine it can be difficult at times in a place like Chicago. I lived there for about six years and know all the solid options there, but it’s not worth it in the long run when you start to look at the financial impact. Saving money is an interesting one for me. I will only go so far out of my way to save money, if I’m not saving enough then I value my time more. Like, I will only drive so far to get cheaper gas, or I will make the majority of my meals myself but I will also have some frozen dinners for nights when I’m just to tired to actively make something. The biggest thing I do to save is prevent the unnecessary spending. I use the stranger test a lot, basically, when I’m going to buy something I imagine a stranger offering me the item or the cash equivalent. If I choose the cash I know I don’t really want the item. That’s a great point about time Zee. My time is worth more to me, so I’m not going to drive across town to get a little bit cheaper gas and the like. I love the stranger test! If you’re finding you’re wanting the cash then it definitely is an occasion where you can save it for something else.